Nadeshiko is excited to learn that her school has an Outdoors Activity Club, but when she enters their clubroom, she finds it quite empty. 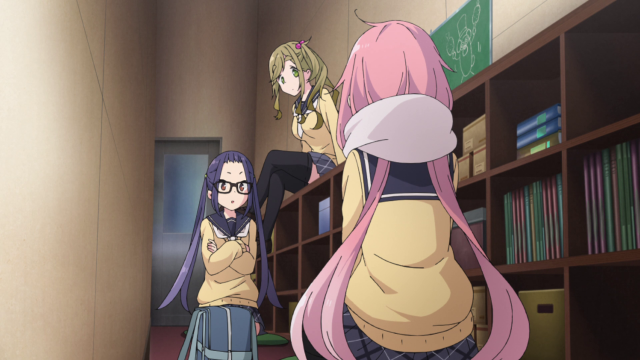 The Outdoors Activity Club’s two members, Aoi Inuyama and Chiaki Ohgaki, arrive, and after mistaking Nadeshiko for an intruder, quickly warm up to her when she expresses an interest in camping. They introduce her to the fundamentals of camping and attempt to set up an inexpensive tent, but one of the poles breaks during assembly. 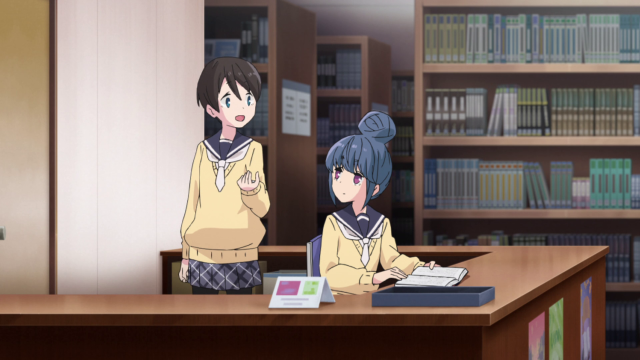 Rin has been watching this from inside the library and is reluctant to join them, but Rin’s friend, Ena Saitou, steps in to assist them, leading Nadeshiko to learn that Rin attends the same school. When the weekend arrives, Rin sets off for a camping trip on her own. She encounters Nadeshiko, who learned of Rin’s plans from Ena, and spends the evening enjoying nabe with her. Rin apologises for having given Nadeshiko the cold shoulder back at school when the Outdoors Activity Club tried to recruit her, and agrees to take Nadeshiko on a proper camping trip. Nadeshiko later awakens to watch the sunrise at Mount Fuji. Meanwhile, Aoi and Chiaki secure part-time employment to earn money and fund the Outdoors Activity Club’s future events. 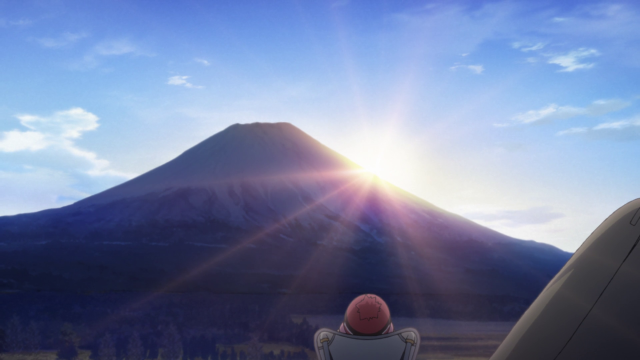 This is where we stand in Yuru Camp△ thus far, and insofar, Yuru Camp△ has proven to be superbly cathartic and heartwarming in showcasing the two main characters as they slowly warm up to one another. 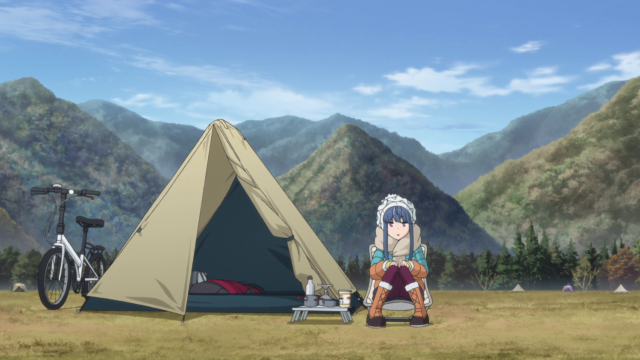 Rin’s enjoyment of camping in solitude is the first element that Yuru Camp△ explores: it is well-established that Rin is fond of going on her adventures on her own, and she frequently comments on how she prefers campsites to be devoid of people, hence her choice to go during the winter, when the cold weather dissuades other campers from visiting. While seemingly indicative of a misanthropic mindset, Rin’s evidently shown to be quite friendly and expressive with Ena. Rin’s desire for solitude is one that I share – some folks simply recharge and rejuvenate themselves by taking time off for themselves, and I often take walks or go to coffeeshops on my own. 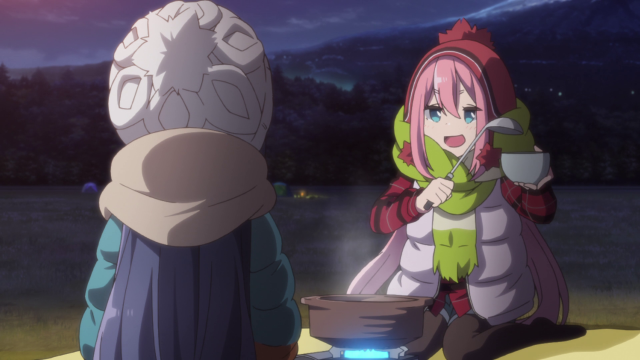 Of course, with Nadeshiko’s introduction, the status quo is disrupted, and Yuru Camp△ has shown its aims are to illustrate how there is a great deal of joy in sharing one’s experiences with others. Nadeshiko is the opposite of Rin: she’s energetic, talkative and open compared to the stoic, reserved Rin, and while perhaps a bit absent-minded, Nadeshiko’s shown to be kind and caring, as shown when she brings in everything and the kitchen sink to prepare a nabe for Rin as thanks for having looked after her previously. 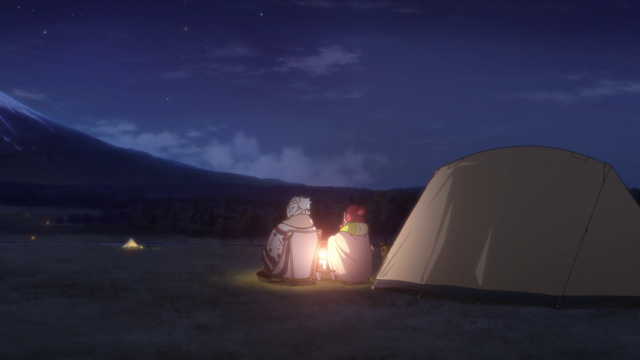 Rin begins to accept Nadeshiko’s friendship, marking the first step towards her transition towards enjoying the company of others while camping. The first thing that comes to mind when Nadeshiko enters the Outdoors Activity Club and its narrow confines is the Industrial Hallway seen in The Matrix Reloaded, which contains back doors that allow one to access any part of the Matrix instantaneously if one possessed the appropriate key. 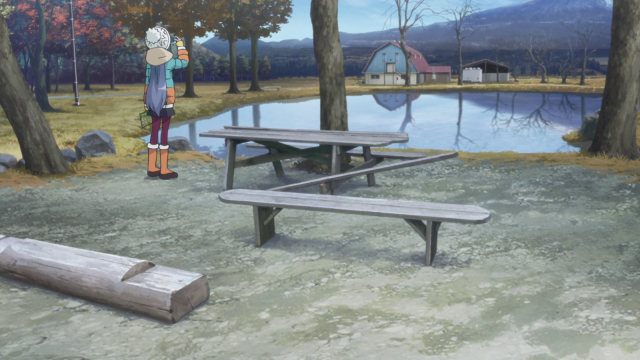 In Yuru Camp△, the reason why the Outdoors Activity Club’s room is so limited is because the club is relatively new and lacking in members. Although Chiaki maintains that their small room is a non-issue owing to their intentions to spend time outdoors, Chiaki and Aoi are quite thrilled when their visitor is interested in joining the Outdoors Activity Club. Chiaki Oogaki and Aoi Inuyama are the two present members of the club. Of the two, Chiaki is more enthusiastic about the outdoors and originally founded the club to be a more relaxed, laid-back version of the more athletically-inclined hiking club. Conversely Aoi is along for the ride and her dynamics with Chiaki suggests that she’s longtime friends with her. 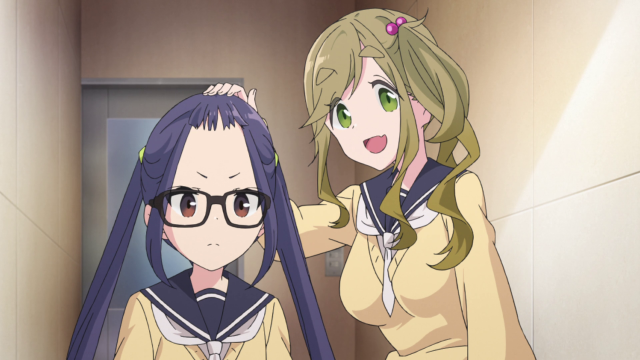 Aoi is voiced by Aki Toyosaki of K-On!‘s Yui Hirasawa, and in Yuru Camp△, Yui’s aural properties are quite visible in Aoi, who seems to also possess Mugi’s eyebrows and Mio’s physique. After brief introductions, Nadeshiko accompanies Aoi and Chiaki out to the school yard, where they set up an apparatus for boiling water. In Survivorman, Stroud uses a similar setup during one of his episodes to boil water in a plastic water bottle so the water heats up sufficiently to kill off pathogens without melting and rupturing the bottle. Because plastic bottles contains various chemicals that leech out of the plastic when heated, the technique has been said to be somewhat risky, but on the flip-side, drinking contaminated water with pathogens such as giardia and cryptosporidium could prove lethal in a survival situation. The topic of how realistic the prices are of the various tents that Nadeshiko finds in the catalogue were the topic of no small discussion off-site, with some folks expressing surprise that tents could cost in the neighbourhood of 82000 Yen (942 CAD), but evidently, said individuals have never been to an outdoors store before: some of the larger tents out there can cost upwards of 950 CAD, such as the eight-person Atmospheric Plus Airbeam sold at Canadian Tire. These are the premium tents for large groups, and most high quality four-person tents roll for around 250 to 300 CAD. 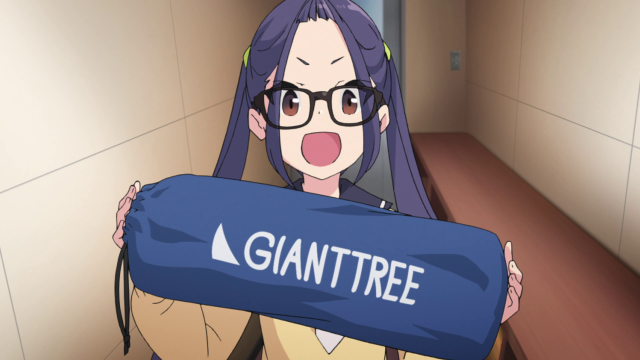 Chiaki brings out a tent costing 980 Yen (11 CAD) that they’d purchased online to try out. The same people above are similarly surprised that tents can run for that little – evidently, reasoning is not their forte. While a cursory glance shows that the most inexpensive tents will roll for around 30 CAD, it is possible that online, there could be a sale driving the price down by two-thirds. Tents of this price range tend to be made of a lighter material and intended to be used as a one-person tent, but for the Outdoors Activity Club, its the perfect way to become familiarised with setting up a tent. During the second episode, viewers are introduced to Ena Saitou, the friend that Rin enjoys a spirited conversation with over their phones during her travels of the first episode. Who Rin was chatting with during the first episode was the subject of speculation, and owing to the conversational tone, I guessed that it would be with a friend. Score one for me, since Ena is that friend: I reasoned that a conversation with parents would likely sound quite different. She’s messing with Rin’s hair here, sculpting a bear with her skills. 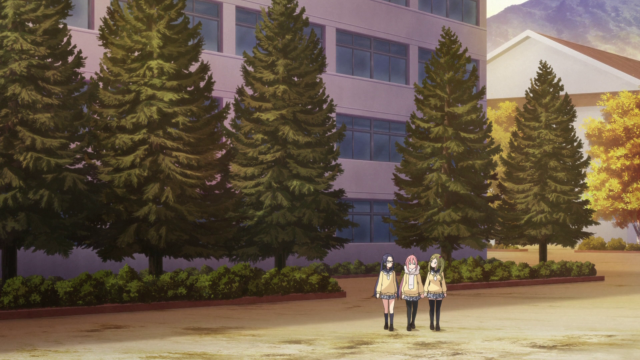 Nadeshiko, Chiaki and Aoi manage to set up their tent outside on the school grounds, but one of the poles snaps cleanly in half from the stresses. The girls begin panicking, and inside, Rin looks up from her book to find them. 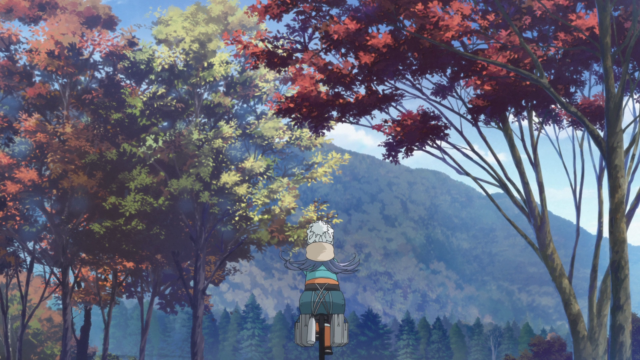 She’s reluctant to help them, worrying that Nadeshiko will recognise her and invariably drag her into the Outdoors Activity Club, thereby taking away from her coveted weekends camping on her own. The most common methods of repairing a broken pole is either tape or ferrules, which can be used to link the broken pieces back together. Ena herself seems to know a thing or two about camping, and in Rin’s stead, goes out to help the Outdoors Activity Club. It is here that Rin shows her “scary face” to Nadeshiko, discouraging her from asking Rin to join the Outdoors Activity Club, but later, it is shown that Rin isn’t doing this out of malice: she’s rather forward about how she feels and isn’t too sure about how to express that she enjoys her solo camping trips. With a bit of assistance, the inexpensive tent is rigged up and good to go. While the narrator’s dialogue conveys a sense of surprise, inexpensive tents can do their job provided that the weather is not too unfavourable. It seems quite capable of fitting three people inside, as Nadeshiko discovers when she decides to take a look inside. 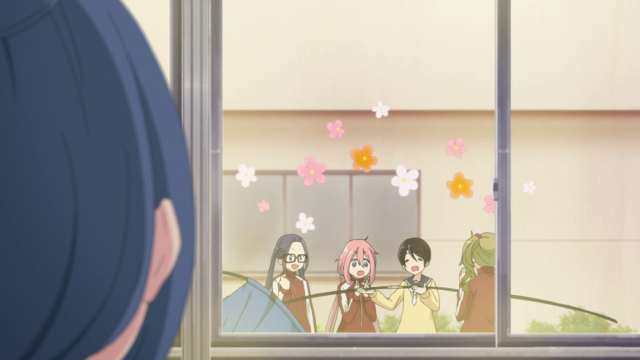 Noticing Rin in the library, Nadeshiko rushes off to greet her, only to paste her face on the window. Such a behaviour in reality is highly implausible, but in anime, it’s presented to be an endearing action: to take a leaf from Mythbusters, don’t try this in real life! Rin’s latest camping trip takes her to Fumotoppara Camp on the West-Northwest side of Mount Fuji and 15.9 km south of Koan Camp by road distance. This camp is a bit pricier compared to Koan, being 2000 yen for solo campers. Set on a plateau that can get chilly by morning, the camp’s managers suggest visitors bring additional clothing to stay warm, and while the facilities at the site are a bit older, the scenery is beautiful: visitors love the wide open expanse of plains that afford them with another beautiful view of Mount Fuji. 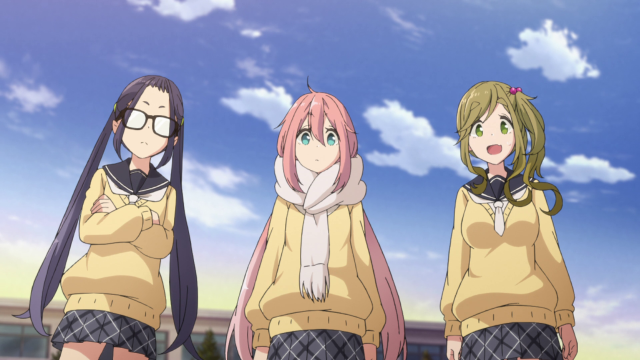 Celtic elements make their way into some songs in Yuru Camp△‘s soundtrack: the use of flutes and fiddle evokes imagery of the rugged terrain, green fields and castles common to Ireland and Scotland. This stands in stark contrast with the distinctly Japanese landscape. The dichotomy between these differing images (i.e. the ones that audiences see, against the ones they expect to see in their minds-eye from the music) yields a very unique atmosphere to the anime that suggests the feelings of joy and catharsis from being in nature are universally shared amongst humans, independently of their culture. On the topic of the price of camping implements, I managed to track down the gear that Rin rolls with on each of her adventures. 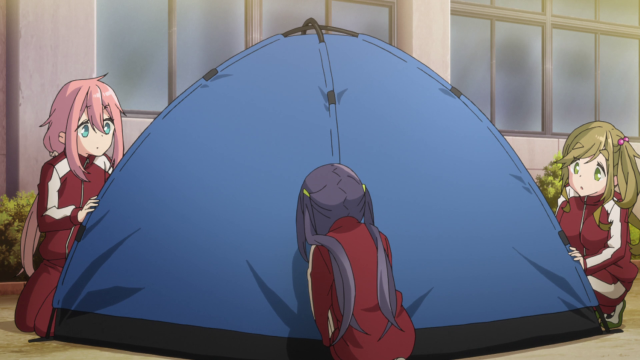 Her tent is a Montbell Moonlight Tent Type 3, which costs 32800 Yen (370 CAD). Rin sleeps in a sleeping bag of an indeterminate build, and underneath is a Logos Self-inflating mattress (6500 Yen, 73 CAD). The portable stove Rin has is a SOTO Windmaster Stove (8000 Yen, or around 90 CAD, but it’s discontinued), and she uses a Captain Stag Aluminium Table (3500 Yen, 40 CAD). She cooks with the Coleman Pack-Away solo cooker set, which is 4298 Yen (48 CAD), holds her water in a 800 mL Clean Canteen Classic water bottle (3000 yen, 34 CAD). Finally, Rin’s chair is an A-Lite Mayfly Chair, which typically sells for 11000 yen (124 CAD). The sum total of Rin’s existing gear, minus her bike, is 779 CAD, and coupled with the price of admissions to a camp ground, it becomes clear that camping is a bit of an expensive hobby. The manga states that Rin’s gear is inherited from her grandfather, who also taught her the fundamentals of the outdoors. Here, I note that while the price tag is a bit of an eye-opener, being a PC gamer is just as expensive: a good entry-level computer costs around 900-1000 CAD, and this is before the monitor, keyboard, mouse and a good library of games to play. Note that there’s Reddit thread, ranking higher in search visibility than mine, where folks try to ID Rin’s gear, but their results are incorrect. There’s a very subtle but impressive indicator of accuracy here in Yuru Camp△: Fumotoppara’s website states that the price is 500 yen, and Rin believes she’ll spend 1500 Yen in total to keep warm. Of course, prices are subject to change (likely increase), but the fact that Yuru Camp△ is taking the time to use current prices is yet another indicator of their commitment to making sure the details are correct. The barn that Rin visits is a part of the facilities at Fumotoppara camp: besides camping spots, there’s also a lodge of sorts here that visitors can stay at. 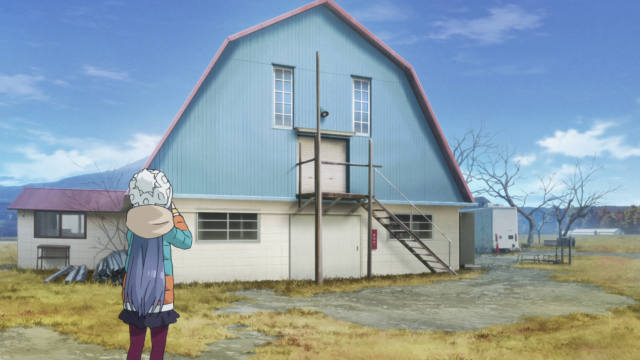 Inspection of satellite imagery and images that visitors have posted show that Yuru Camp△ is going to continue its impressive depiction of real-world locations. There is indeed a small pond adjacent to the barn, and a wooded area nearby where Rin is shown to take a walk. She sends her photographs to Ena by means of a messaging system, and here, stops by the pond. Fumotoppara’s website has a request to patrons, asking them to not fish or swim in the small pond. 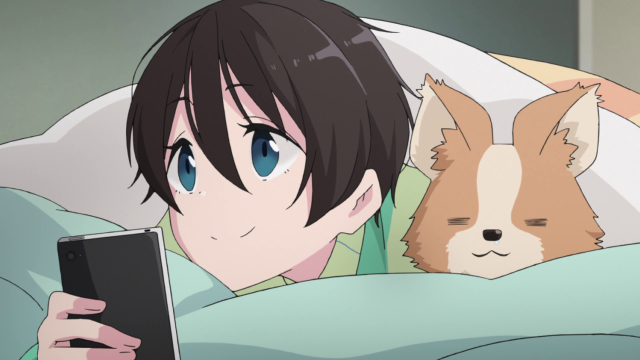 While Rin’s enjoying the quiet of a brisk autumn morning, Ena’s in her warm bed with her dog. She contemplates getting up, but decides against it, and I find myself a bit envious of folk who can spend weekends sleeping in. Either a consequence of foolhardiness or discipline (or a combination of the two), I wake up a full twenty minutes later than I do on workdays during weekends so I can hit the gym, and I go lift weights most weekends unless the weather is particularly unfavourable (read “unless it’s lower than -35°C before windchill or lower than -40° with windchill”), so I don’t really use my weekends to sleep in. It speaks volumes to just how greatly Rin enjoys her solitude when she considers this to be “crowded” at Fumotoppara Camp. It’s hardly ever this quiet out in the mountains, but this year, with the complementary park passes expired, the standard admission fee of 20 CAD per family has returned, which could reduce the attendance once more. The crowds last year meant that for both hikes I took, I needed to wake up at the crack of dawn in order to secure parking: casuals and families would otherwise overwhelm parking spots. As the evening light casts the land in the glow of longer-wavelength light, she begins to regret having given Nadeshiko the cold shoulder earlier. 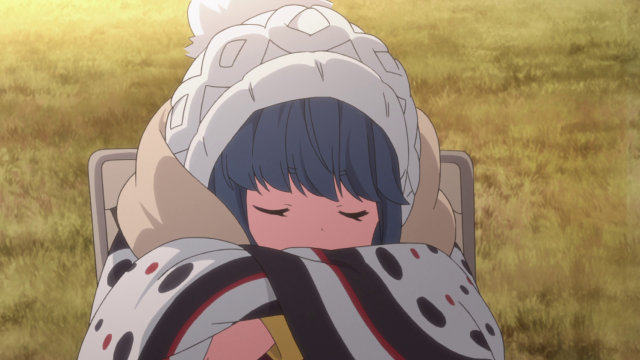 Rin’s status as a seasoned camper is further show in this moment: she’s bundled up and quite ready for the cold mornings that are common to the area. 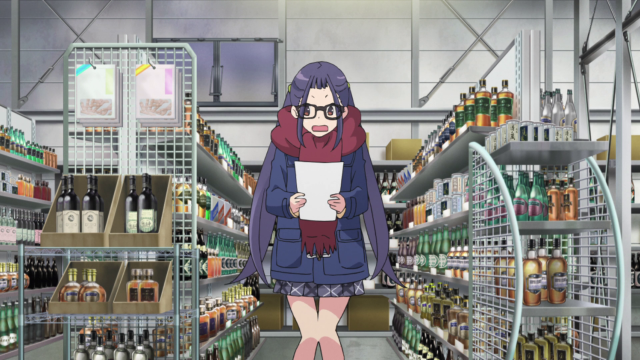 Early in the second episode, Rin considers bringing some ingredients to make a more substantial camping meal, but a lack of grocery stores en route means Rin’s prepared to fall back on her standby. 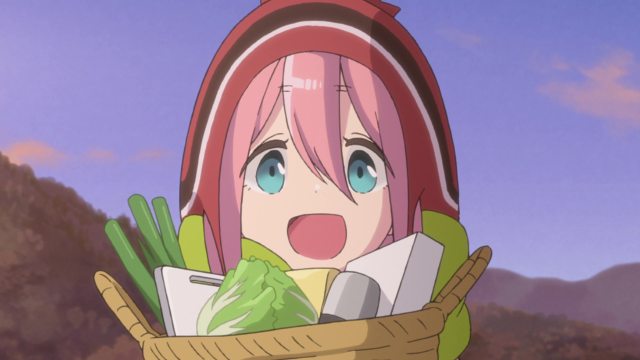 Nadeshiko appears in person after Rin begins thinking about how to best approach her, with a large basket of vegetables and cooking implements in hand. As it turns out, Ena had sent her the campsite that Rin was hanging out at, and feeling that the time has come for her to properly thank Rin for having helped her during the first episode, shows up to cook Rin dinner as the day ends. 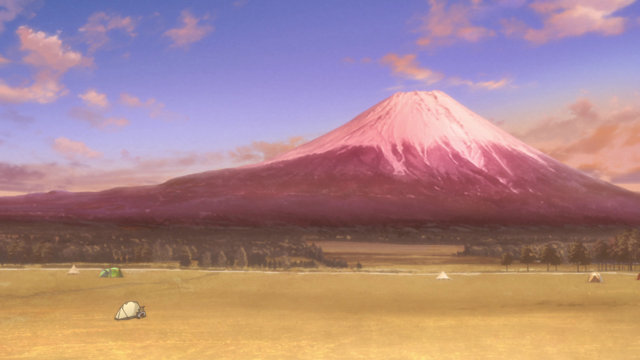 Having spent much of the day trying to find her camping gear, Rin requests a ride from Sakura to reach Fumotoppara. 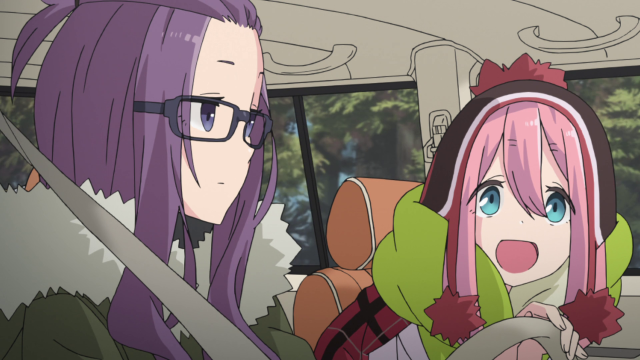 Amongst the viewers, Sakura’s quickly won MVP for being the most considerate sister: she drives Nadeshiko to Fumotoppara and then heads off the chill with her friends, before returning to the parking lot, where she and Nadeshiko spend the night. It’s a far cry from the physical beating she dispensed on Nadeshiko the previous episode, and I earlier remarked that could’ve been a one-off. 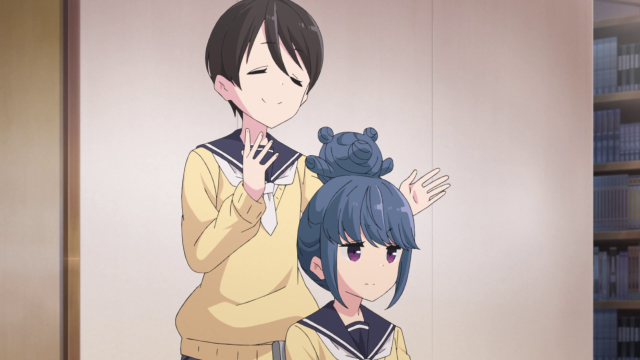 By episode three, both Rin and Nadeshiko’s personalities have been established, but for the other characters, more time will naturally be required to accomplish the same. Rin asks to help Nadeshiko prepare things, but Nadeshiko insists that this time, she’ll handle things as thanks. While Rin had earlier decided against the purchase of firewood, Nadeshiko’s choice to make nabe means that there will be warmth nonetheless, and while quite touching a gesture, Nadeshiko also implies that her enjoyment of nabe is partially because it’s easy to cook for: one simply needs to add all of the requisite ingredients into the pot, put the heat on and wait for things to cook. To help Nadeshiko stay warm, Rin provides her with some heating pads. 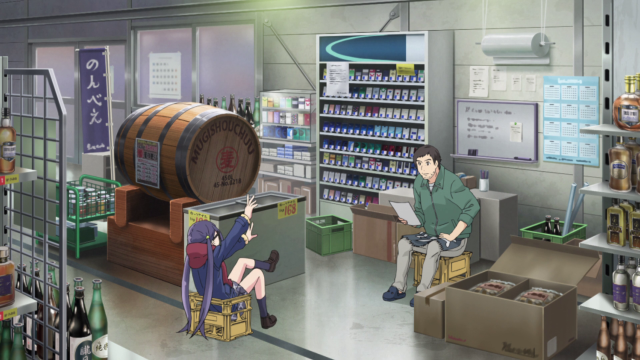 Elsewhere, Chiaki applies for a position in a liquor store located in Minobu. The employee interviewing her remarks that her timing is fantastic since one of their previous employees had left, and their talk immediately turns towards Chiaki’s availability. During the course of her interview, Chiaki is understandably tense, a bit of a contrast with her usual gung-ho, energetic self. She seems to take after K-On!‘s Ritsu Tainaka and Azusa Nanako as far as designs and personalities go. When Chiaki learns that the employee interviewing her is also a graduate of Motosu High School, she stands up in excitement and sits down promptly, right into the box and finds herself stuck in the same manner that Bender of Futurama is stuck when he’s knocked onto his back. Audiences cannot help but laugh at her misfortune here, but it turns out that Chiaki managed to get the position. Aoi was similarly successful, and with the funds coming in from the two, it looks like the Outdoors Activity Club will finally have some cash flow to drive their adventures. Encouraged with this fact, Aoi and Chiaki look forwards to doing a proper camping trip in the upcoming winter with Nadeshiko. 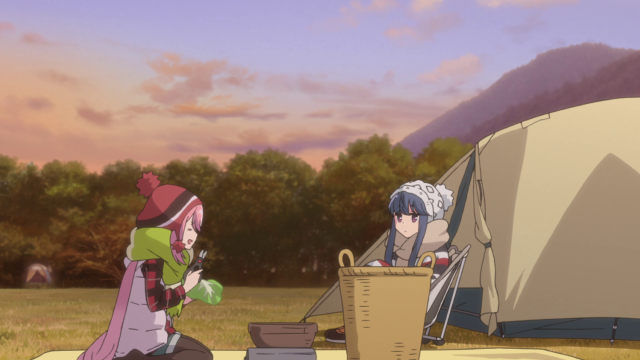 This aspect seems to suggest that a camping trip with everyone, including Rin and Ena, will be the end-goal of Yuru Camp△‘s first season, with the remaining episodes dealing with Rin’s gradual entry into the Outdoors Activity Club and how she’ll help bring everyone up to speed with the fundamentals of the outdoors. As the skies darken, Nadeshiko’s gyoza nabe is finally ready, and she passes a bowl to Rin, who finds the spices and flavour to be perfect for warming her. She describes it as ぽかぽか (romanised “pokapoka”), and very soon, finds the heat to be quite sufficient so that she can remove her hat and scarf. A good 火鍋 can do exactly thus: mine was with beef, lamb, chicken, pork, shrimp, fish, squid and vegetables, plus yi mien, seasoned with generous helpings of hot sauce, that warmed me up on New Year’s Eve. 火鍋 is the Chinese version of nabe and differs only in the sauce: our homemade variation involves a combination of 蒸魚 soy sauce and hot chili oil, which provides flavour and a bit of a kick. Rin breathes out a bear-shaped cloud of steam while enjoying her gyoza evokative of the “bear hair” that Ena styled Rin’s hair into during the second episode. Similar to how some folks cannot un-see the turkey leg-shaped hole in the wall that Superman makes when he throws Batman through the wall in Batman vs. Superman, I’m hoping that folks cannot un-see the fact that this steam is bear-shaped now that I’ve mentioned it. Rin remarks that Nadeshiko has the unique talent of making everything she eats look fantastic, although she loses out on the top spot to Les Stroud of Survivorman, who has eaten critters and all sorts of interesting things on his Survivorman show. His reactions to drinking fresh water, or eating a fish are absolutely priceless, and there are some episodes where he catches things like scorpions or Witchetty grubs for eating. Stroud notes that some creepy-crawlies actually don’t taste half had, and in general, he prefers cooking everything he catches for safety reasons. 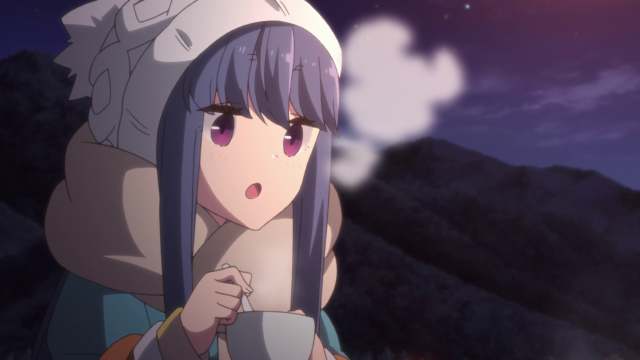 Readers dropping in to my Yuru Camp△ discussions will probably do well to remember that every post is going to feature at least one screenshot of the characters by their tent, underneath the stars with a single light source, whether it be a campfire or electric torch, illuminating the scene. Curiosity about the sky conditions led me to take a look at light pollution maps: Koan Campground has brighter skies than Fumotoppara. To put things in perspective, one would need to travel 20 kilometres west of Calgary’s city centre, to reach skies of a darkness comparable to those at Lake Motosu, and Fumotoppara’s skies are as dark as those of Bragg Creek, a small hamlet 30 kilometres west of Calgary. Nadeshiko’s smile is one of the most cheerful I’ve seen in any anime, conveying to audiences fully the sense of bliss and content she is experiencing in the moment. Nadeshiko is evidently someone who knows how to appreciate the smaller things in life, from the taste of food to the comfort conferred by a good chair. 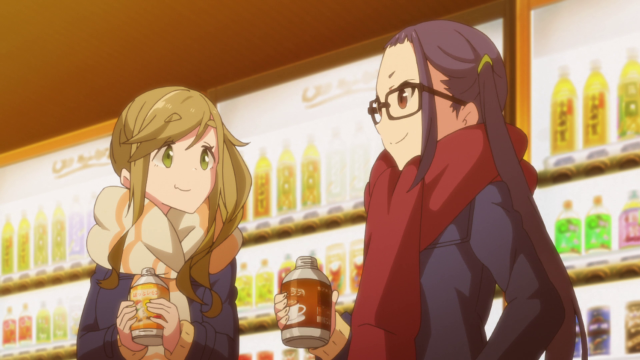 Three episodes in, Yuru Camp△ is proving itself to be a solid slice-of-life anime and differentiating itself from the other shows in a season where the number of slice-of-life shows are non-trivial: it has the same gentle atmosphere as Flying Witch, which I thoroughly enjoyed for the similarly calming mood. A beautiful sunrise awaits Nadeshiko, who manages to wake up at the crack of dawn to see it before turning in once again. 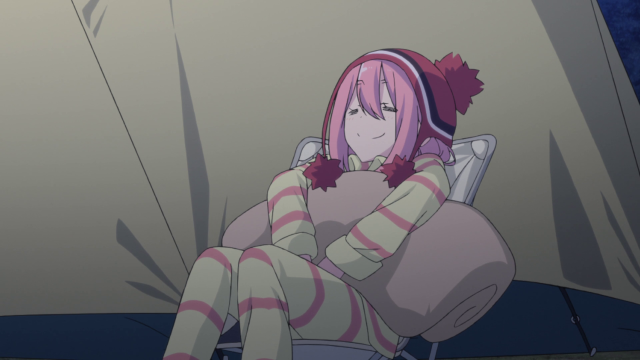 Thus, this post is in the books, and I remark that Yuru Camp△ is the sort of anime that I’ll write about every three episodes, to offer some comments on the depiction of scenery, the journey that Rin and Nadeshiko go on as friends, and whether or not Yuru Camp△ merits the moniker of “Survivorman The Anime”. In the meantime, DICE has released the Battlefield 1 Apocalypse maps to the CTE, and it’s time to drop in and see how the new maps play out. 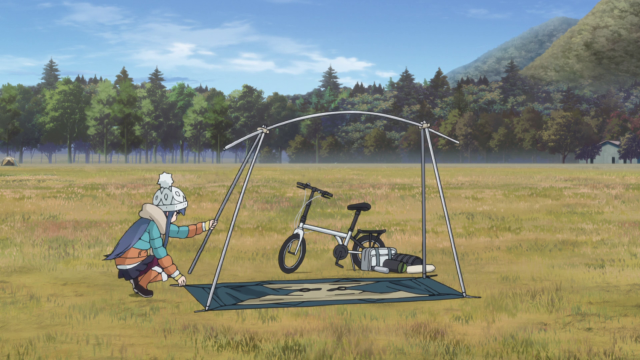 After three episodes, it is quite evident that Yuru Camp△ is probably not a suitable substitute for Survivorman as far as survival tricks go: Les Stroud certainly has not carried a propane stove and cooking ingredients into the wild. Similarly, the girls are unlikely to require the advanced survival techniques that Stroud outlines in Survivorman. 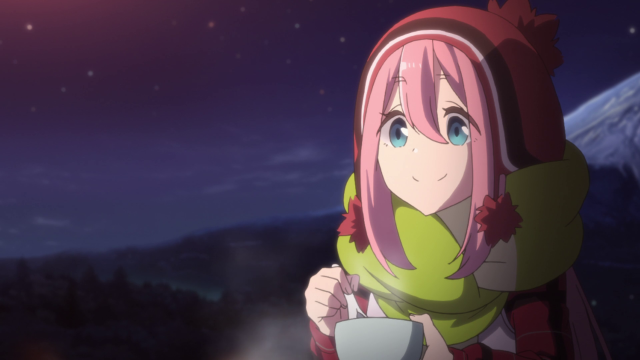 With this being said, the narrator occasionally steps in to explain some of the basics in camping, helping audiences quickly ascertain what the characters are doing, and in keeping with Stroud’s ability to improvise during his journeys, the girls in Yuru Camp△ have demonstrated similar abilities to make the most of things. 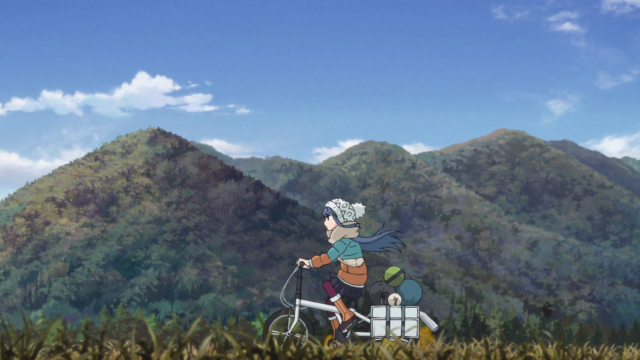 In conjunction with the superb landscapes and a soundtrack that conveys a sense of relaxing calm, Yuru Camp△ definitely lives up to its name of being a laid-back camp to the same extent that Survivorman is about a man who survives in the wild. Looking ahead, it seems that Rin still has yet to formally join the Outdoors Activity Club and allow the club to be fully activated, so I’m rather curious to see what process is taken for Rin to do so, as well as how Nadeshiko might influence this. Furthermore, with Aoi and Chiaki gearing up to fund the Outdoor Adventure Club’s activities, it’ll be interesting to see just how the different individuals come to meet and what sort of antics ensure. I wonder if Yuru Camp△ will lead to an increased interest in camping, as other anime have done so for things like World War Two tank games and the like. The amount of detail in Yuru Camp△ is staggering: it’s been fun and will continue to be fun, to identify all of the things that the anime will incorporate into its story; they give the anime a considerable boost in realism! On star gazing, I got my start through Terence Dickinson’s guides for amateur astronomers; a good pair of binoculars and some persistence are oftentimes the bare minimum required to have a good time. The lighting around my area’s been worsening as of late even as the city installs new LED street lights to cut back on light pollution, but the fact is that the city is sprawling more, which corresponds with more lights filing the night sky. With this being said, a good pair of binoculars can help one find some constellations and planets, and some major events, such as meteor showers and aurora, can occasionally be seen. Of course, we won’t be able o see the Milky Way, and one of my goals is to travel somewhere dark so I might experience this at least once.